Kaiseki rules at Kyo-to in Legazpi Village. (SPOT.ph) Amid brutalist and often monochromatic high-rise buildings that line Legazpi Village is a mysterious entrance that appears to be strangely misplaced. 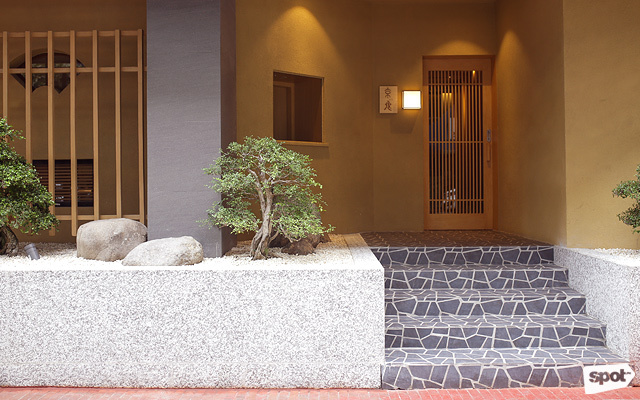 Picture a traditional Japanese doorway—minimalist, bright, and pleasing to the eyes, it will draw you in. 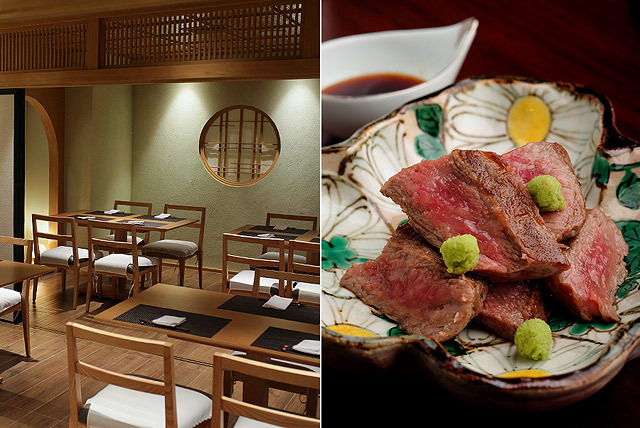 Climb a stone stairway and enter Kyo-to, a quaint kaiseki restaurant helmed by Chef Ryohei Kawamoto. Chef Ryohei’s caliber in the kitchen can be traced back to his days at Japan’s famous Tsukiji Fish Market where he began as a young assistant buyer. Five years ago, he relocated to the Philippines to become the private chef of the Japanese Ambassador to the Philippines. Creating a kaiseki restaurant was only something he had dreamt of when he was a teenager, but his natural culinary prowess and perseverance has opened many doors for him including Kyo-to. People often confuse an omakase with a kaiseki. 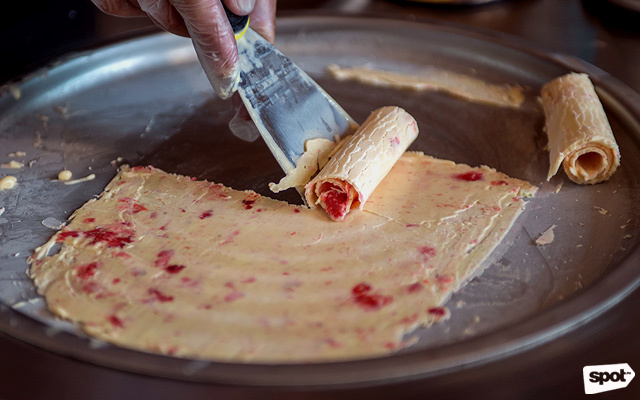 Although both, essentially, are multi-course dinners and considered an art form in the culinary world, the latter stands out through the chef’s dependence on seasonal elements. And like most, if not all, kaiseki restaurants, you’ll never know what you’ll get on your plate. This also means that prices will depend on what the chef finds for the day, but one thing's for sure: This is the kind of meal that you won't soon forget. 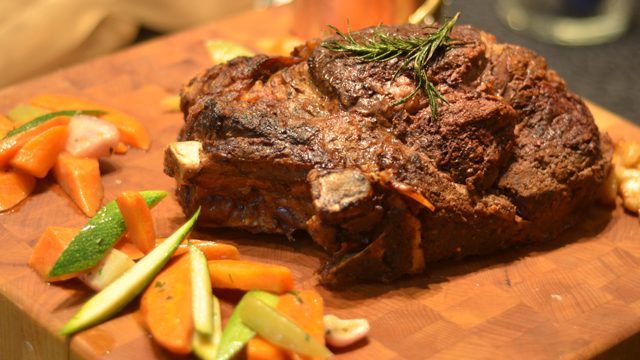 Here, diners are at the mercy of the chef’s picks for the day. Kyo-to’s menu changes constantly but Chef Ryohei’s methods stick to centuries-old techniques, offering a five- to seven-course meal, which normally begins with a light and clean appetizer and ends with something sweet. The best seats are, of course, at the eight-seater counter, where guests sit only a few inches away from the Japanese chef. There is fluidity and grace in Ryohei’s movements as he prepares each dish skillfully. It’s hypnotizing, to say the least, as if each gesture is done in ultra-slow motion. Often compared to the French amuse bouche, the sakizuke is the first course of Chef Ryohei’s five-course menu the day we visited. The sakizuke is used to whet the diner’s appetite and open up the senses to the freshest ingredients of the day. The Hokkaido Crab with Cucumber Vinegar Jelly is a phenomenal starter: Small and sweet chunks of poached Hokkaido crab are nestled in a crab shell. The tart vinegar jelly and pickled cucumber add a surprising contrast to the seafood dish. 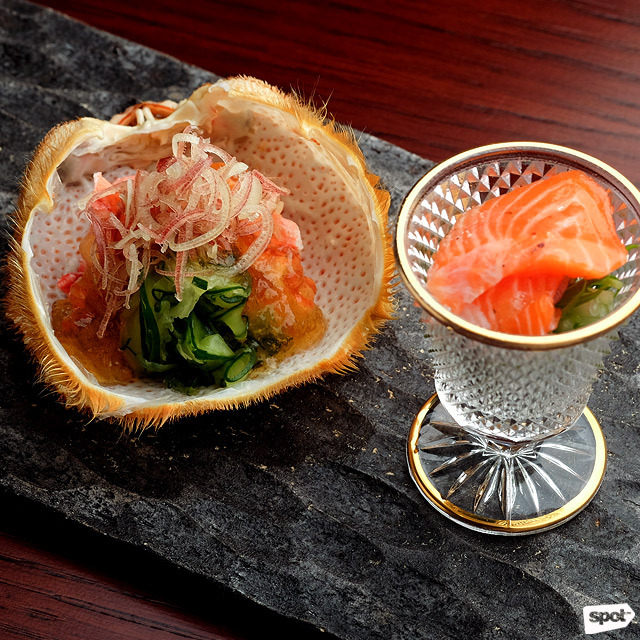 It is served with a few slices of salmon sashimi on the side. Up next is the sashimi set or makozuke. 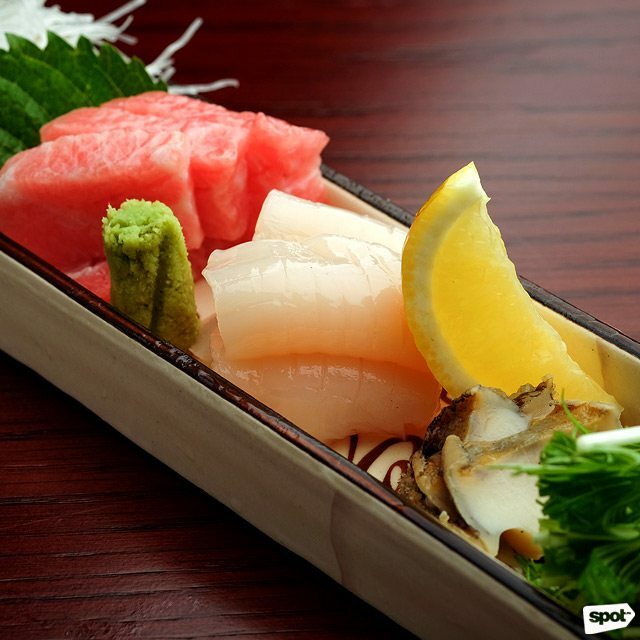 In season is the Toro (tuna belly) and Hotate (scallops), with each piece delicate and flavorfully unique. The toro may be one of the best sashimi you’ll eat in the Metro—the texture is luxurious while the taste is fatty and bold. 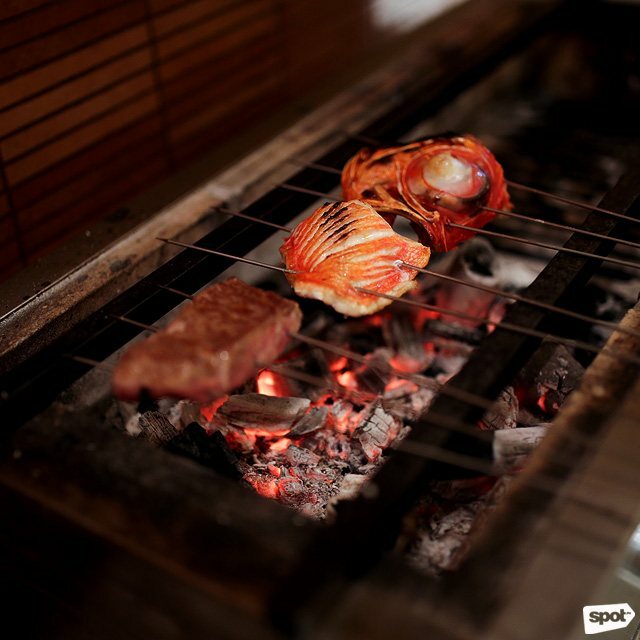 Chef Ryohei may either serve a suimono or soup course or go ahead with a grilled meat or fish sampler. The Somen Noodles with Saba is made up of charred mackerel in a sweet and clear warm broth. Chopped spring onions are sprinkled on top to add crunch and a refreshing lightness to the dish. 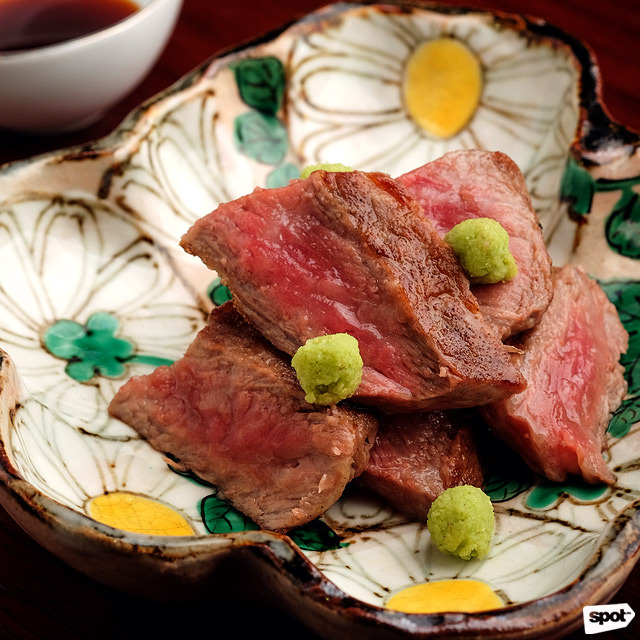 Chef Ryohei then prepares a small plate of sliced, melt-in-your-mouth Wagyu A5 Ohmi Sirloin as main course. 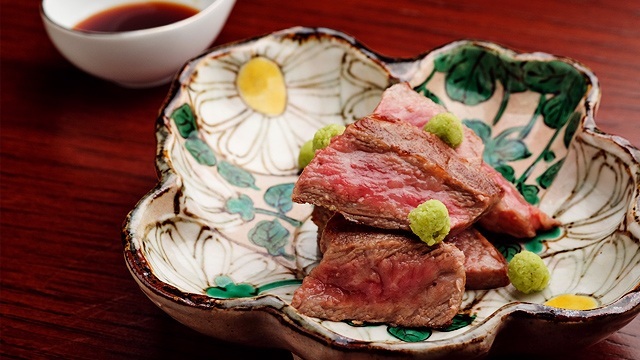 The simple and tender beef dish works perfectly with a bowl of steaming white rice and a pinch of wasabi. 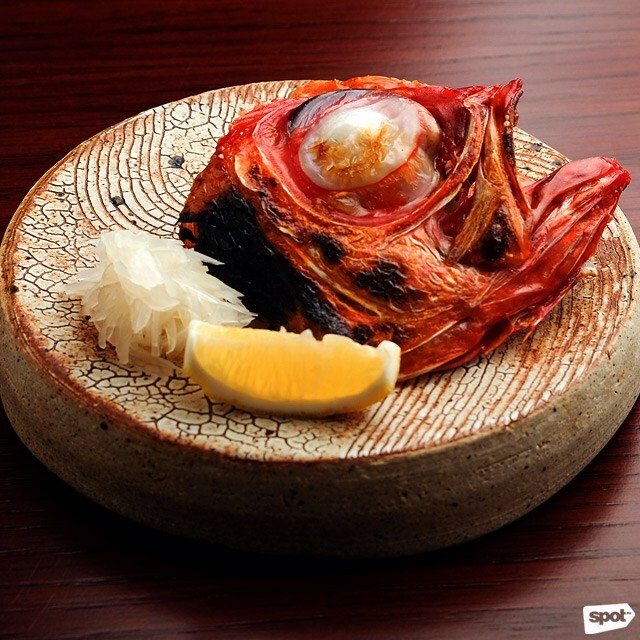 The Golden Eye Snapper, on the other hand, is a delectable grilled fish head that you eat with pickled radish shavings and a squeeze of citrus. After that, a bowl of Ice Cream with Kinako and Mochi is brought out as the chef’s last course or mizumono. 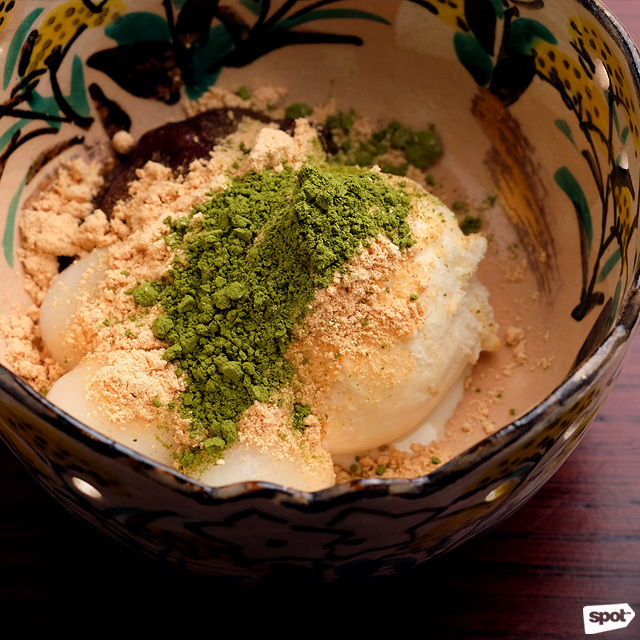 The velvety homemade vanilla ice cream paired with kinako or roasted soy bean flour, Japanese rice balls, and matcha powder, results in a symphony of sweet, nutty, and savory goodness. 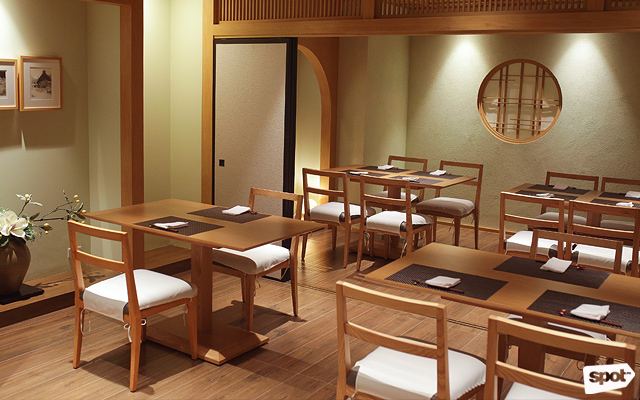 Time stops when you're at Kyo-to. Perhaps it's the mystery of the place and your next meal. 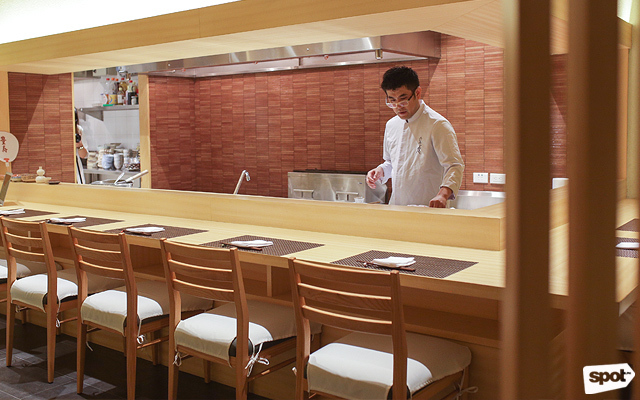 Or it can also be the riveting experience of placing your full trust in Chef Ryohei. Whatever the reason may be, know you're in good hands.